The Casuariidae include two extant taxa, the Casuariinae (cassowaries) and Dromaiinae (emus). Whereas cassowaries live in forested environments of northern Australia and New Guinea, the single extant species of emus is widely distributed across open areas of Australia. The earliest Casuariidae stem from the late Oligocene Riversleigh and Etadunna Formations of Australia and belong to the taxon Emuarius (Boles 1992, 2001b). Two species can be distinguished, Emuarius ("Dromaius") gidju (Patterson and Rich, 1987) and E. guljaruba Boles, 2001. 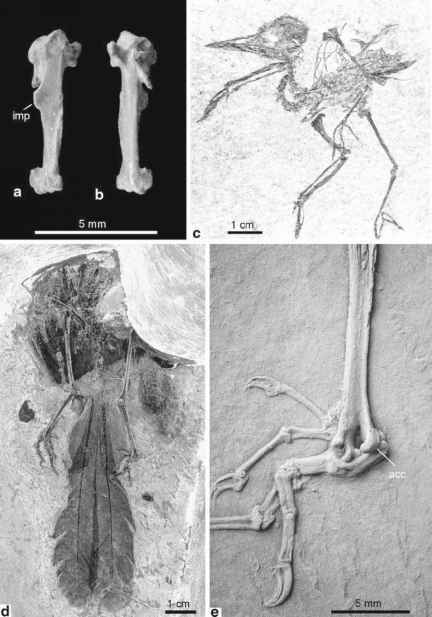 The former is known from a number of skeletal elements including a partial beak, whereas for E. guljaruba only a tarsometatarsus was described. Emuarius was considered to be a stem group representative of the Dromaiinae (Boles 1992, 2001b), and mainly differs from extant emus in the more slender femur, whose proportions are similar to the femur of cassowaries. The tip of the premaxilla is rounded as in extant emus, whereas it is narrower and more pointed in cassowaries. If it is correctly assigned to the Dromaiinae, Emuarius indicates that the lineages leading to cassowaries and emus separated in the Paleogene. The weight of E. gidju has been estimated at 19-21 kg (Boles 1997b), and the species was probably less cursorial than extant emus but more so than the graviportal cassowaries (Boles 1997b).